Bernie Sanders has laughed off claims that his presidential campaign has been the cause of the stock market’s recent steep decline. Sanders appeared on ABC’s This Week Sunday and addressed Blackstone CEO Steve Schwarzman’s notion that one of the reasons the financial market has become unsettled, along with a slowdown in China and geopolitical risk, is the surge in the congressman’s campaign. “The reason that I am laughing is that I fully admit to having a big ego, like many other politicians. 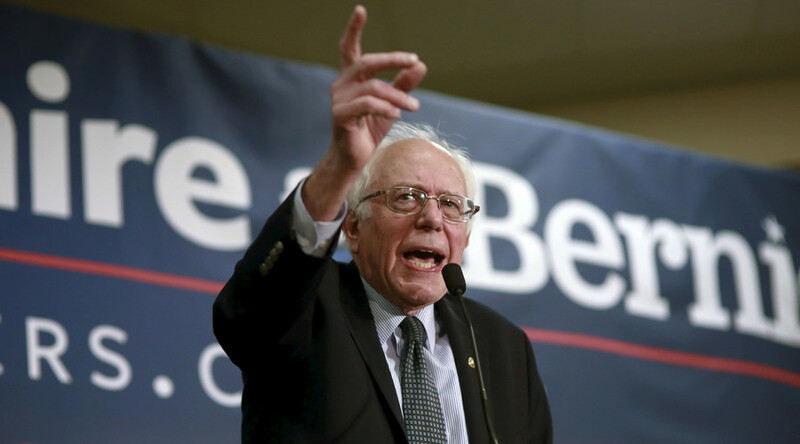 But the idea that Bernie Sanders’ candidacy, because that it has growing support all over this country, is unsettling world markets, is absolutely absurd”, said Sanders. However, Sanders said gaining the attention of Wall Street suggests his campaign “is doing very well,” because, if elected, he plans to reinstate a law separating commercial and investment banks. “Wall Street’s greed and recklessness and illegal behavior drove this economy into the worst recession since the Great Depression. Millions of people lost their homes, their life savings, and their jobs. And, yes, I believe that we have to break up the major financial institutions. We have to re-establish Glass-Stegall,” he added. The Glass-Steagall Act was an emergency banking law brought in during the Great Depression-era that prohibited commercial banks from dealing with the investment business. The act was eventually repealed by Bill Clinton. Sanders also took the opportunity to dismiss candidate Hillary Clinton’s recent endorsement from Iowa’s leading newspaper, the Des Moines Register, which seems to claim Sanders doesn’t have the deep understanding of foreign policy needed for the presidency. “We are taking on the entire establishment. We are taking on the economic establishment, we’re taking on the political establishment, and, with all due respect, we are taking the media establishment,” he said. “I expect that Secretary Clinton will get a lot of the endorsements from mainstream media, but I have the endorsement, and I’m very proud to say, of 2.5 million individual contributions to my campaign,” Sanders said.